Source: CICH graphic created with data adapted from Public Health Agency of Canada, Maternal Experiences Survey, 2006-2007. http://www.phac-aspc.gc.ca/rhs-ssg/pdf/tab-eng.pdf -accessed July 24, 2017. According to the Maternity Experiences Survey, the vast majority – 95% of women – had their first prenatal visit in the first trimester. 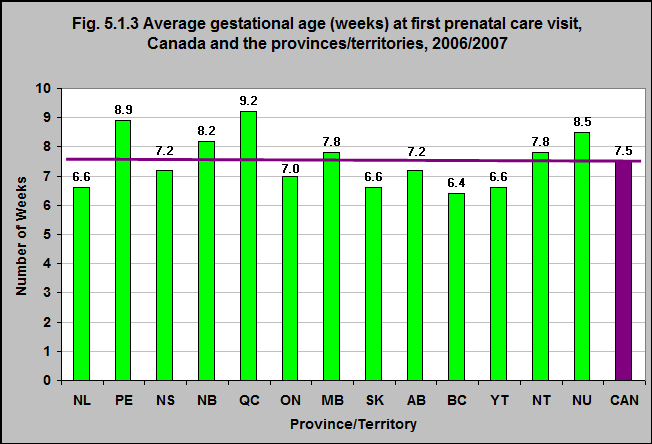 On average, Canadian women had their first prenatal visit at 7.5 weeks gestation. That varied between the provinces and territories – from 6.4 in British Columbia to 9.2 in Québec. 1Tayebi T, Hamzehgardeshi Z, Shirvani MA, Dayhimi M and Danesh M. Relationship between Revised Graduated Index (R-GINDEX) of Prenatal Care Utilization & Preterm Labor and Low Birth Weight. Glob J Health Sci. 2014 May; 6(3): 131–137.